This is one of the topics we explore in our Confined Space Train the Trainer and Fall Protection Competent Person classes. Just to recap: A confined space is: 1) large enough to enter, hard 2) to get in or out of, and 3) not designed to have people in them. OSHA doesn't regulate confined spaces, they regulate permit-required confined spaces which are confined spaces that also contain (or could possibly contain) a serious safety or health hazard. A serious hazard is one that prevents self-rescue. So let's go back to our pit. 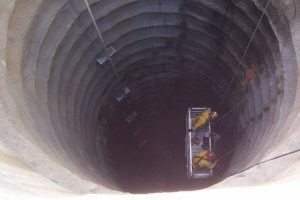 A fall off the ladder poses a hazard that can prevent self-rescue and the pit meets the definition of a confined space. So OSHA would call this a permit space, right? No. Fall hazards in a permit-required confined space. "Would a pit, which meets the definition as a confined space, also meet the definition of a permit required confined space, if the only hazard is a potential fall from 21 feet while descending on a ladder within the pit?" "Specific fall protection requirements were not included in the PRCS standard. Fall protection and ladder safety requirements are addressed in Walking — Working Surfaces, 29 CFR 1910, Subpart D and the General Duty Clause of the Occupational Safety and Health Act. Therefore, if the described potential fall hazard is the exclusive hazard within this pit, a permit program would not be required." And this seems to make sense. Like I said, confined spaces aren't regulated and the ladder is being used in accordance with the OSHA standards. So simply using a ladder use shouldn't cause the space the ladder is being used in to suddenly come under a new set of rules. After all, a similar situation could arise in any narrow, constricted area of a plant accessed by ladder. ". . . If a particular standard is specifically applicable to a condition, practice, means, method, operation, or process, it shall prevail over any different general standard which might otherwise be applicable to the same condition, practice, means, method, operation, or process." So the ladder standard is more applicable than the confined space standard. "Note: If the only hazard associated with a confined space is a fall hazard, it is not covered by the Confined Space rule." It would seem that this note and the federal letter of interpretation are closely aligned, but I'm not sure. Federal OSHA only addressed a fall off a ladder while getting into the pit. OROSHA broadened that to include any and all fall hazards. And there's a big difference. Take, for example, a space I inspected in a hydrodam. Access was via a fixed ladder 20 feet down a shaft. At the bottom of the shaft the space opened into a gallery that afforded access to the gates: massive chunks metal that rode up and down through large slots to control water flow. Anyone in this space had to maintain 100% tie-off to prevent a fall into one of the slots and the employer properly classified these spaces as permit-required. At the meeting I described this space and explained that there are spaces where the hazard isn't just using an access ladder, the fall hazard is inherent to the design of the confined space and is present regardless of how you access it. But regulation writing is an inexact process and wording came out the way it came out. From a safety standpoint, I think the crux of this issue deals with inadvertent entry and the fact that employers have to prevent that when it comes to permit spaces, but not confined spaces. If an untrained employee, for whatever reason, decided to climb down the ladder into the pit, no OSHA rules will have been broken since there wouldn't have been any employee exposure to a hazard, at least not one that violated OSHA rules. However, if an employee decided to enter the gallery in the hydrodam and wander around, they would be exposed to very serious hazards that would clearly prevent self-rescue. Hence, it should be treated as a permit-required confined space and specific entry procedures should be followed.